Special Olympics is a movement that touches me very personally. As a Special Olympics Ambassador for Team USA, I hosted the opening ceremonies of the 2010 USA National Games in Nebraska and was just recently honored to be a part of the 2014 Special Olympics USA Games in New Jersey. 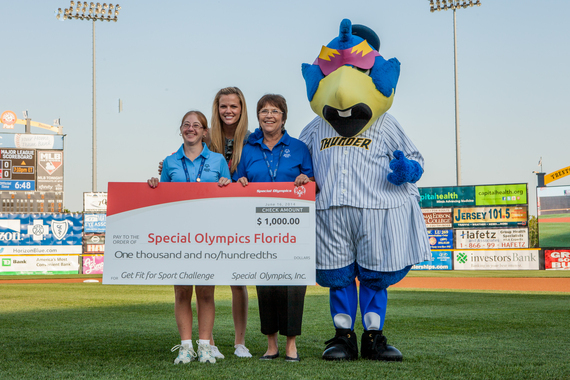 I've been involved with the organization for about six years and was inspired by my aunt, a Special Olympics athlete. Watching someone who is different from you overcome obstacles, once given the same chance as others, is empowering. I learned from a very young age to show respect to all people and not use words that are harmful, like the R-word. My mom would always say there's a simple fix for making someone feel included and showing respect -- it's as easy as using a different word. That thought was running through my head when I emceed the Opening Ceremonies of the USA Games alongside 76ers point guard Michael Carter-Williams. I watched a parade of 3,500 Special Olympics athletes wearing their states' colors walk into the Prudential Center, in Newark -- to put that into perspective, about 2,800 athletes competed at the Olympic games in Sochi. The atmosphere was electric -- the arena was packed with 1,000 coaches, 10,000 volunteers and over 70,000 spectators cheering on athletes over a number of days. It still gives me chills. Hands down, this was an Olympic moment -- the magnitude of the moment brought tears to not only my eyes, but to many of the parents, family members, coaches and volunteers. Understanding how hard these athletes have worked to make it to the Games, representing every single state across the country, was an extremely moving and incredible moment for me to experience first-hand. Throughout the week I saw the incredible passion Special Olympics athletes have for their sport. I felt lucky, and I have to admit, a bit unworthy to have the chance to give out medals to a few powerlifting champions and hear about their amazing accomplishments. One athlete told me he just turned 40 years old this year and has acquired 57 medals throughout his entire career. When watching some of the competitions throughout the week, I saw how these athletes give it their all every single time. The compassion and excitement they have for the opportunity to play, the unwavering display of sportsmanship, and desire to ultimately win -- are some of the first lessons every child learns when out on the playground. These athletes can teach us all about the true joy of sport. It's not about the jersey you wear or the contract you sign -- it's about getting out on the field, in the pool, on the court and doing your best and playing to win. Watching the high-fives and cheers the Special Olympics athletes give their opponents after every game, every competition, win or lose -- helped me reconnect to what is really the most important -- it's the opportunity to show how hard you trained; it's the chance to simply play for the love of the game. Special Olympics is changing the way the world views people with intellectual disabilities. Every single person in the world should have the opportunity to compete -- no matter their ability level -- and I'm so proud to have the chance to be part of a movement that is breaking down the barriers that exist for people with intellectual disabilities. I encourage more and more people to experience what I experienced during the Games -- the fun, the friendships and the intense competition. Join me in Los Angeles next summer for the Special Olympics World Games. To find out more about the 2015 Special Olympics World Games in Los Angeles, visit here.